Learn here how to cut a round kibbeh sahnieh into diamonds! To make this classic Lebanese kibbeh sahnieh, use a large pan, 14-16 inches, and layer the kibbeh with a lemony meat and onion filling. Bake and broil until deep golden brown, and you’re golden too! While I’ve been diving in whenever possible lately to the experiment of perfectly tinted buttercream, piped into perfectly defined swirls and roses and leaves, my mind gets to wandering over into the land of Lebanese cuisine (surprise), and which dishes are the more intricate, the more complicated—projects that would rank up there with learning to pipe a buttercream rose-adorned cake. Baklawa, of course. The diamonds, the fingers, the rosettes, the nests, the turbins. You know it’s all coming your way!! Fatayar. The triangles are the more challenging, if only to keep the seams closed. But the square sfeha rank up there too. Manakeesh. Okay, the flatbreads can be rustic. But I want perfect rounds and I want them all the same size and thickness. Kibbeh. How’s your torpedo-shaped arras coming along? Dan reminds me that the key here is repetition. Practice makes perfect. If I’d just do a weekly 2-3 dozen arras, I’d have perfect torpedoes down cold. He’ll stand by and give me feedback, just as they emerge hot from the fryer…. For my kibbeh nayeh, I’m content where I am with the plating. We love to have more than one kibbeh spice-level option for our kibbeh dinners, so usually I make two platters of raw kibbeh. One, the easier flavor that is not at all spicy, like my mom’s. 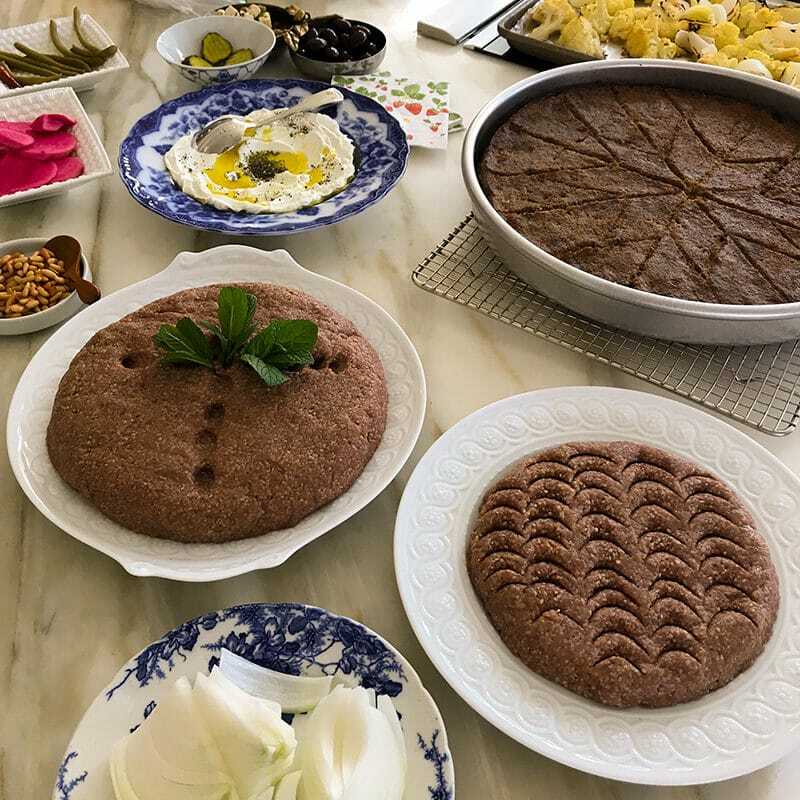 The kibbeh is mounded high and shaped into a circle or an oval, with a cross deeply imprinted in it and a bouquet of fresh mint in the center. Sometimes raw sweet onion slices are arranged around the kibbeh perimeter, sometimes offered in a bowl next to. And another platter for spicy hot, a flat platter, decorated with the tip of a spoon to make scale-like indentations. I see room for experimentation here, where the scales could take on various patterns. Ohhh fun. There is another kibbeh shape that has captured my imagination and attention: the huge, round layered and baked sanieh—two layers of kibbeh top and bottom, filled with ground meat/onion/pine nuts and baked to deep golden brown—scored in diamonds that form a kind of geometric flower. This is not traditionally the baked kibbeh of Aboods, or Abowds, or of our local Woody’s Oasis Lebanese restaurant. The tradition there is for squares or rectangles. The reason seems obvious enough: an easier cut, and at least for a restaurant like that, easier to serve in large quantities from big sheet pans. But that big round kibbeh! I needed to master it. The first challenge was to find a pan large enough to make the correct pattern. My round cake pans go up to 10 inches, which is not big enough to get the design right. I knew I could find huge round pans for this express purpose at the kitchenware shops in Dearborn, but what about all of you? I wanted an option that could be had swiftly, without a big online search and mail order. When I sauntered unsuspecting down the cakey pan aisle at Meijer, I was floored to find a big, huge “deep dish pizza” pan, 14 inches and perfect for my sanieh. The sides are just a tad higher than the pans made for sanieh (of kibbeh or baklawa), but no matter. You can’t make this stuff up. Or, you can, but I didn’t! I’m hoping you can find the big 14-incher nearby too. The next, more serious challenge: the cutting of the kibbeh. I studied, and studied. I found making a map not only very helpful, but also satisfying. The first time you go for it, trace your pan on a sheet of newspaper, then draw the cuts. When you do same with your knife on the kibbeh, score lightly to get it right. The beauty of the top of a kibbeh sahnieh is it’s like a white board. You can just smooth away any scoring that didn’t work out, using a hand moistened with some ice water. Also, there is a key refinement I’ve made to my kibbeh sahniehs in the last couple of years, and that is with the layers. Top and bottom, I’ve gone even thinner than I used to. We’re talking quarter inch or so. Then the filling spread in the middle is not as dense as I used to do. Overall this makes an even less meatloaf-y, more delicate kibbeh that still holds itself together. We love it. Here’s the way to cut the flowery diamond kibbeh. My savory, Lebanese version of learning a buttercream rose, one you don’t just look at, but eat it right up instead. We’re using the same recipe as for the 13x9x2 kibbeh sahnieh, but now we’re flattening the layers so the quantity still works even though the pan here is bigger. Get my kibbeh spice, plus the fine bulgur and Lebanese olive oil in the Maureen Abood Market Kibbeh Kits. To make the househ filling, in a large frying pan, heat the neutral or olive oil until hot but not smoking. Add the onions and about a half teaspoon of the salt and sauté until soft. Add the ground beef and season with cinnamon, another half teaspoon of salt, and black pepper. Cook until browned, breaking up the meat with a metal spoon into smaller bits as it cooks. Squeeze the lemon juice over the househ, taste, and adjust seasoning if needed. Stir in the pine nuts and set aside. 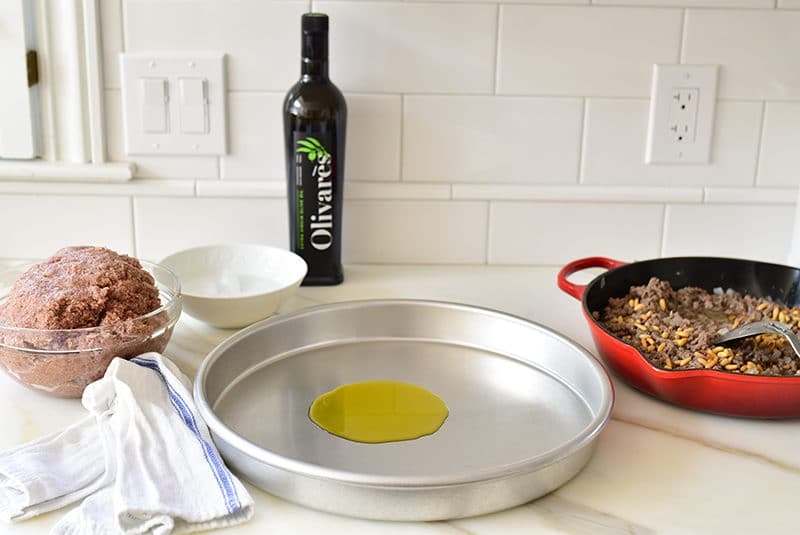 Coat a 14-inch round cake pan with olive oil. 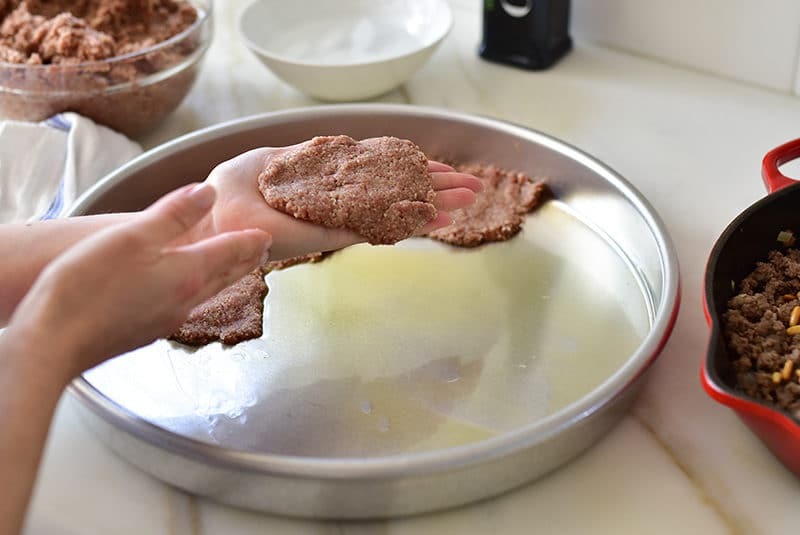 To make the bottom layer of the kibbeh, use about ¼ cup of kibbeh at a time and flatten to about ¼-inch thickness between the palms of your hands. Press the flat piece into the bottom of the pan. 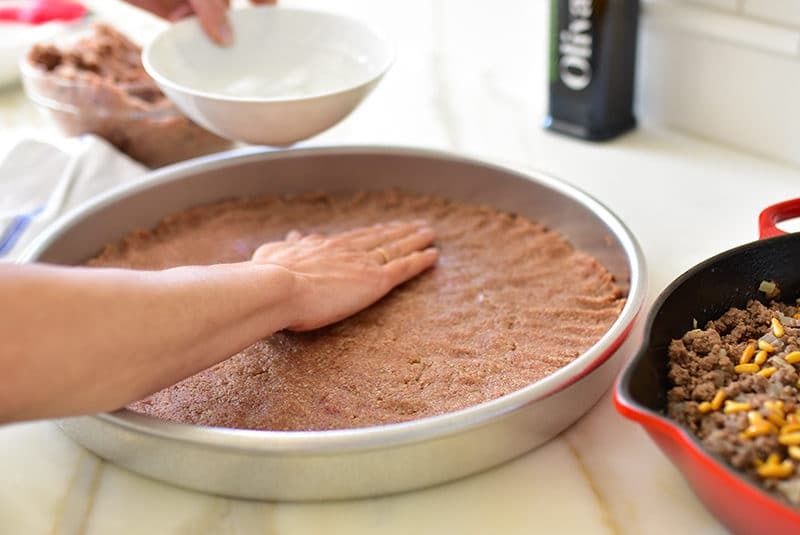 Do this repeatedly, smoothing the flat pieces together with your hands that have been moistened in ice water and sealing all fissures, until the bottom of the pan is filled with a flat layer of kibbeh. 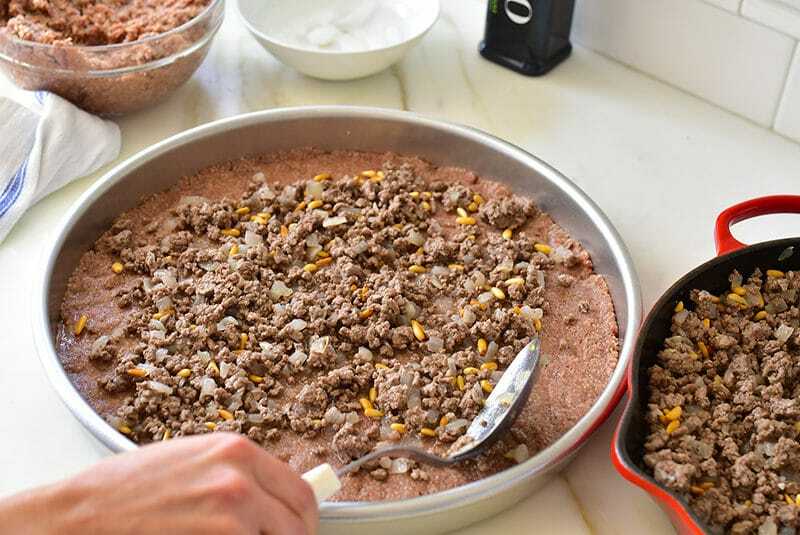 Spoon the househ filling evenly over the kibbeh, including some of the meaty, lemony juices. 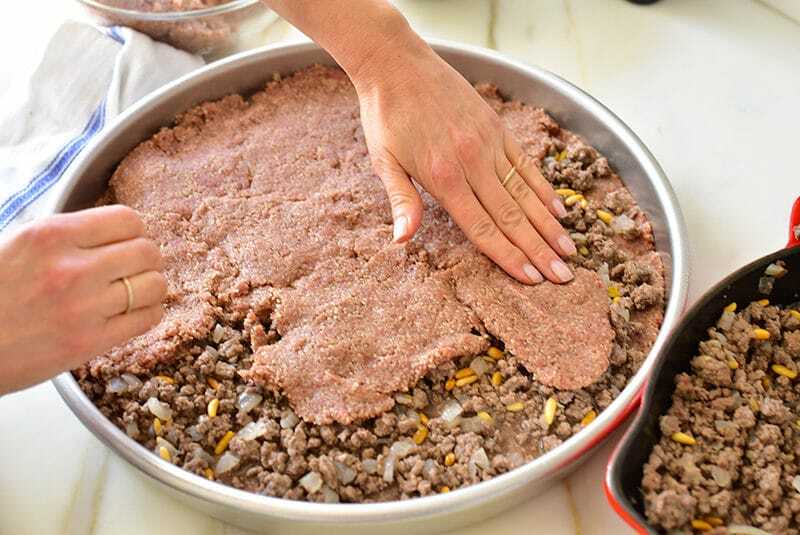 Make the top layer of the kibbeh the same as the bottom layer, forming flat pieces and laying them over the filling close together. Smooth the pieces with your hands moistened in ice water to seal all fissures. Smooth the kibbeh around the perimeter of the pan as well. 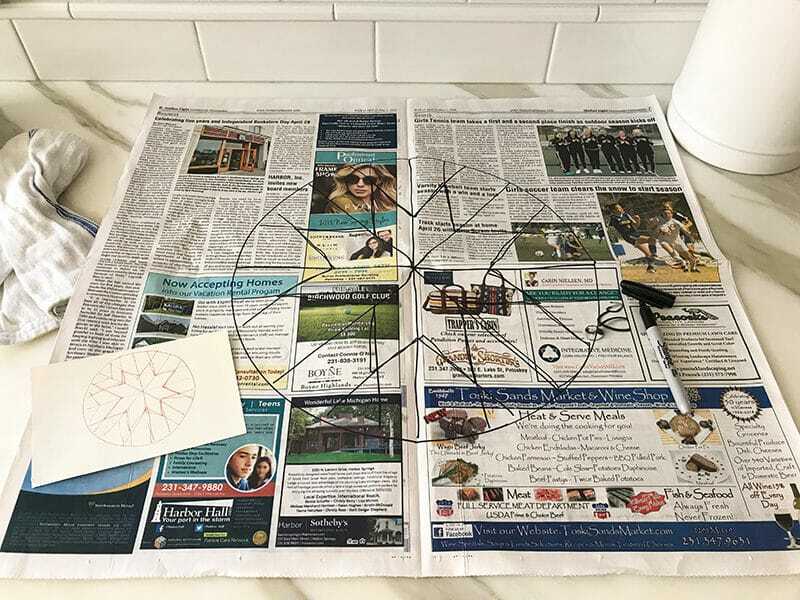 To cut the kibbeh, make an actual-sized drawing of the design on a sheet of newspaper to practice the design. Rather than describe here, I’ll direct you to the video above to see how it’s done! 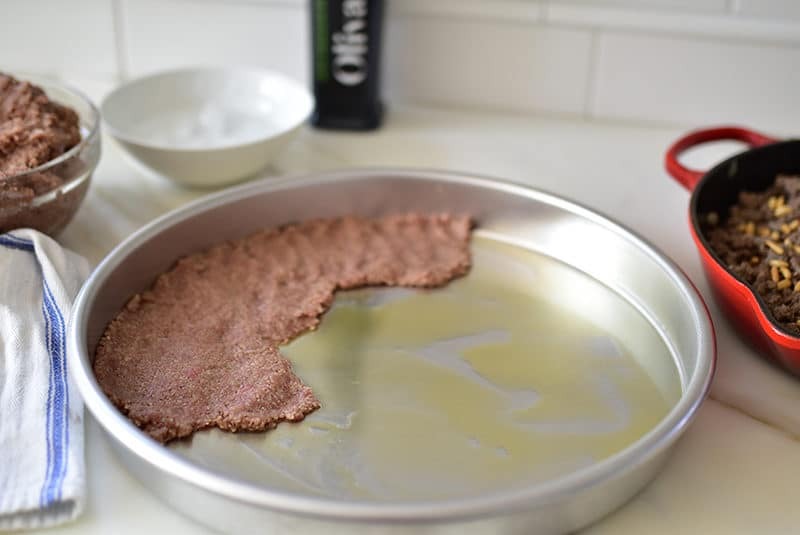 Bake the kibbeh for about 40 minutes, then brush the top with olive oil. Continue baking about 10 more minutes, or until browned. Turn on the broiler and broil the top of the kibbeh for a couple of minutes, until the top layer has a deeply browned crust to it. Serve the kibbeh warm, cutting along the scored diamonds to serve. 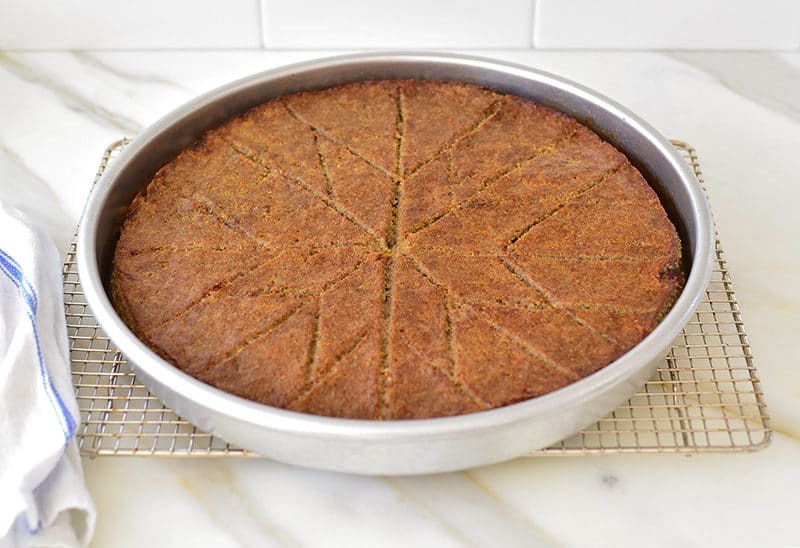 10 Responses to "Kibbeh Sahnieh in a Round Pan"
Deirmimas Lebanon. I want to Thank-you for posting. So good to hear Linda! My father’s family is from Diermimas, so we share a similar way and I’m happy these recipes are true to your husband’s! This looks delicious! But… no butter on top? I will try it! I know–but of course you can add butter, which makes the kibbeh ever so luscious! I found this one with just the oil toward the end of baking to be really sumptuous also! Oh, Girl, so many, many childhood Sundays with Kibbee Sahnieh and Kibbee Nayeh and Potato Salad and Salata and Koosa and Waraq Inab and Khubz Arabi, and Fried Chicken. When did they have time to make it? Spread out gorgeously on the crocheted table cloth. Served immediately after Mass. They loved us so much. So much gratitude for the tender sweet memories that always tug at my heart. I continue to make Kibbee in my Sita’s 100 year old sahnieh. “They loved us so much”–ohhhhh, how happy they would be knowing you felt it and remember it all so dearly! Thank you Julie! I’m jealous of your sahnieh! Wonderful Lynette, thank you so very much for sharing this! I love this recipe, is there anyway I can stop the meat dough from shrinking significantly during cooking? What am I doing wrong? Hi Rebecca–my kibbeh shrinks too, always. Interesting question. I wonder if soaking the wheat longer would help. Or the opposite! Don’t soak the wheat at all. I will experiment and be back in touch if I hit on a solution!